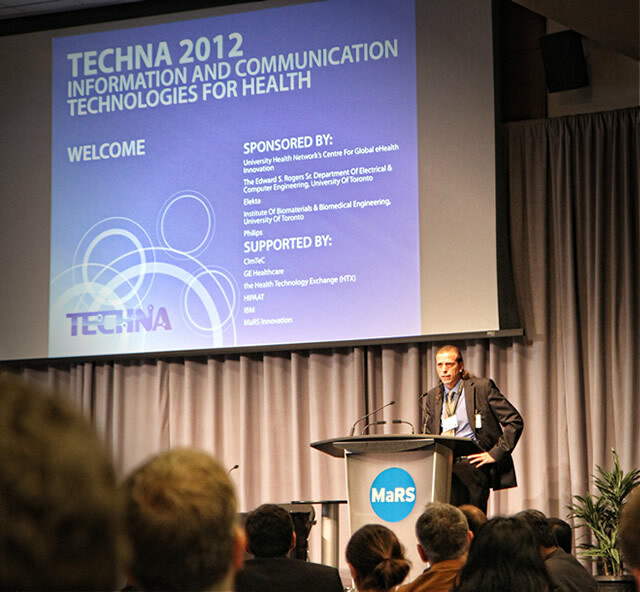 The Techna 2012 Symposium brought together a diverse group of leaders and experts to discuss the challenges and opportunities that Information and Communications Technologies (ICT) pose for health care. Dr. David Jaffray, Director of Techna, opened the day with the central question: “We could be doing much more, why aren’t we?” ICT promise gains in efficiency and performance for many aspects of health care delivery, yet implementation has lagged. An intricate network of privacy laws, institutional policies, and technical regulations and constraints interact to govern the implementation of ICT in health care. These challenges were discussed along with potential solutions, and examples of both successes and failures for ICT in health care. Speakers presented data and their impression of the challenges, with time for group discussions and questions posed to the whole panel. The focus stayed on the big idea and overarching issues, rather than the particulars of any one technology. In parallel with the presentations and panel discussions, the group kept up a dialog with tweets and text messages displayed on large screens to either side of the main stage in real-time. Though there are some scientific and engineering problems to solve, no one expressed any doubts that Canadians have the expertise to overcome those technical challenges; the focus was on how to implement ICT solutions. How could conflicting stakeholders and misaligned incentives be reconciled? Conflicts within the system and complexity of implementation were identified as barriers to ICT adoption. Entrepreneurs were advised to focus on technologies and business models that could avoid the complexity problem, and that government and socialized medicine stakeholders needed to be involved in the process of finding practical solutions. 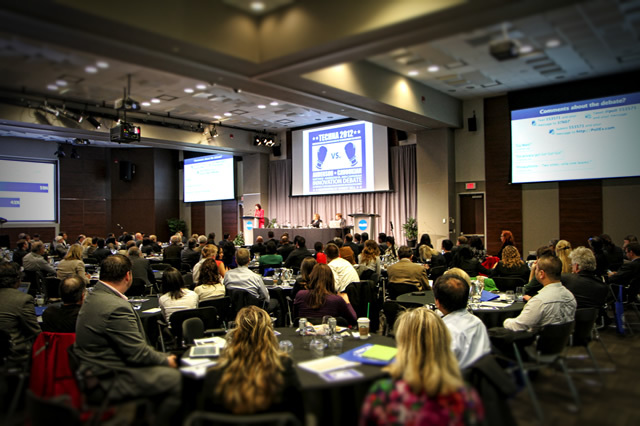 The symposium attracted a diverse group of stakeholders, including researchers, industry leaders, representatives from non-profits, government officials, policy experts, patient advocates, and members of the media. 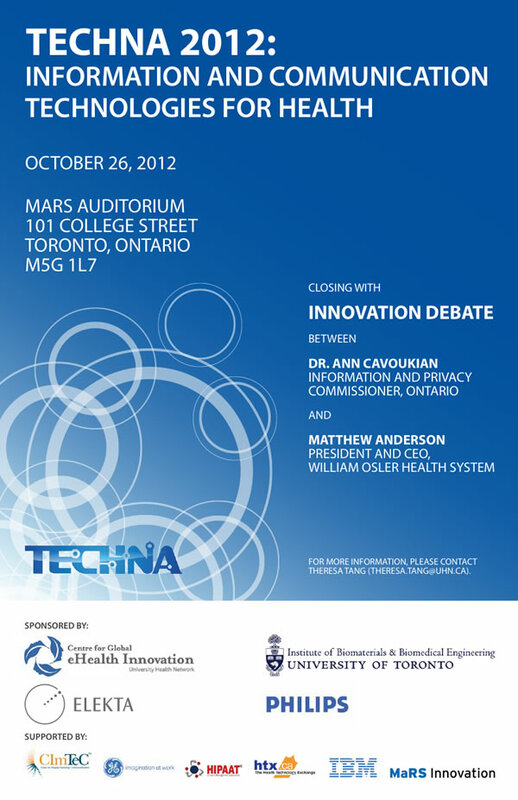 The symposium featured a debate on privacy and healthcare innovation between Dr. Ann Cavoukian, Ontario’s Information and Privacy Commissioner, and Matthew Anderson, President and CEO of William Osler Health System. Prior to the debate, approximately 70% of the voting participants believed that privacy was stifling innovation in health care. Mr. Anderson, arguing that privacy regulations were a burden on health care and innovation, cited examples of problems and outbreaks that had been solved in ways that would not have been possible under a regime of strict privacy regulation. Suggesting that health care concerns were more important than matters of privacy, he peaked with a discussion of the 2003 SARS outbreak, an example where the privacy laws were relaxed under supervision of the Privacy Commissioner in order to track the spread of the disease. He asked the audience “Is it only in crisis situations that health care trumps privacy?” Dr. Cavoukian suggested that privacy concerns could easily be met if considered early in the design process, and that we do not need to choose between privacy and innovation. Her argument was persuasive, as many changed their vote to leave the polling evenly split by the end of the debate. “Saying privacy stifles innovation is like suggesting that research ethics boards stifle research,” Dr. Cavoukian concluded. The inaugural Techna Innovator Award was presented to Prof. Denis Protti for his impact in the field of ICT. 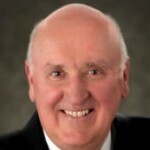 Prof. Protti is the founding director of the University of Victoria’s School of Health Information Science, and also a founding member of COACH, Canada’s Health Informatics Association. He served as an outside expert to the UK’s National Health Service eHealth strategy, creating the evaluation measure for health IT progress and implementation that came to be known as the “Protti Score.” The award was presented by Drs. Peter Rossos and Igor Jurisica of Techna.